Aim. This paper is a report of a study to identify the content of, and participation in, medicine discussion between nurse prescribers and people with diabetes in England. Background. Diabetes affects 246 million people worldwide and effective management of medicines is an essential component of successful disease control. There are now over 20,000 nurse independent prescribers in the UK, many of whom frequently prescribe for people with diabetes. With this responsibility comes a challenge to effectively communicate with patients about medicines. National guidelines on medicines communication have recently been issued, but the extent to which nurse prescribers are facilitating effective medicine-taking in diabetes remains unknown. Methods. 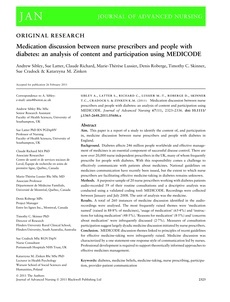 A purposive sample of 20 nurse prescribers working with diabetes patients audio-recorded 59 of their routine consultations and a descriptive analysis was conducted using a validated coding tool: MEDICODE. Recordings were collected between January and July 2008. The unit of analysis was the medicine. Results. A total of 260 instances of medicine discussion identified in the audio-recordings were analysed. The most frequently raised themes were ‘medication named’ (raised in 88·8% of medicines), ‘usage of medication’ (65·4%) and ‘instructions for taking medication’ (48·5%). ‘Reasons for medication’ (8·5%) and ‘concerns about medication’ were infrequently discussed (2·7%). Measures of consultation participation suggest largely dyadic medicine discussion initiated by nurse prescribers. Conclusion. MEDICODE discussion themes linked to principles of recent guidelines for effective medicine-taking were infrequently raised. Medicine discussion was characterized by a one statement-one response style of communication led by nurses. Professional development is required to support theoretically informed approaches to effective medicines management.